The Chukar Partridge or Chukar (Alectoris chukar) is a Eurasian upland gamebird in the pheasant family Phasianidae. It has been considered to form a superspecies complex along with the Rock Partridge, Philby’s Partridge and Przevalski’s Partridgeand treated in the past as conspecific particularly with the first. This partridge has well marked black and white bars on the flanks and a black band running from the forehead across the eye and running down the head to form a necklace that encloses a white throat. The species has been introduced into many other places and feral populations have established themselves in parts of North America and New Zealand. 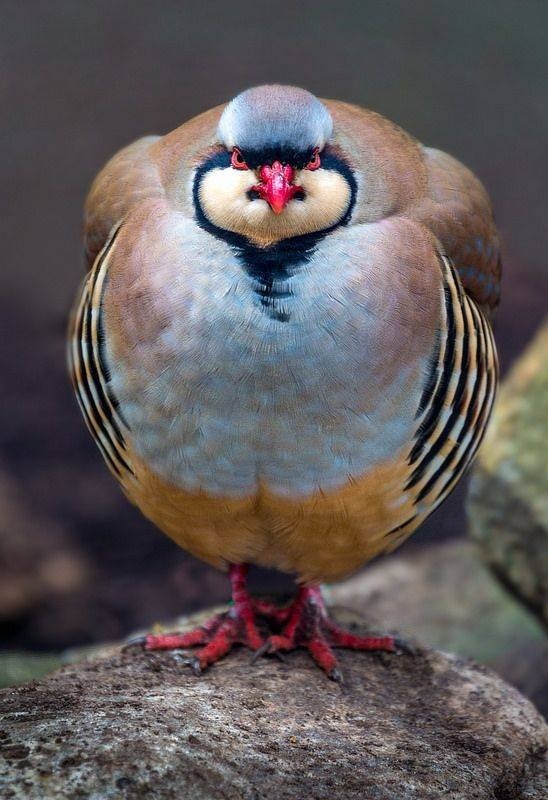 The Chukar is a rotund 32–35 cm (13–14 in) long partridge, with a light brown back, grey breast, and buff belly. The shades vary across the various populations. The face is white with a black gorget. It has rufous-streaked flanks, red legs and coral red bill. Sexes are similar, the female slightly smaller in size and lacking the spur. The tail has 14 feathers, the third primary is the longest while the first is level with the fifth and sixth primaries. Other common names of this bird include Chukker (sometimes spelled as ‘Chuker’ or ‘Chukor’), Indian Chukar and Keklik. This partridge has its native range in Asia, including Israel, Lebanon, Turkey, Iran, Afghanistan, Pakistan and India, along the inner ranges of the Western Himalayas to Nepal. Further west in southeasternEurope it is replaced by the Red-legged Partridge, Alectoris rufa. It barely ranges into Africa on the Sinai Peninsula. The habitat in the native range is rocky open hillsides with grass or scattered scrub or cultivation. In Israel and Jordan it is found at low altitudes, starting at 400 m (1,300 ft) below sea level in the Dead Sea area, whereas in the more eastern areas it is mainly found at an altitude of 2,000 to 4,000 m (6,600 to 13,100 ft) except in Pakistan, where it occurs at 600 m (2,000 ft). They are not found in areas of high humidity or rainfall.